I was more than delighted when I picked up the Sunday Journal a fortnight ago to discover that Liam Hillen was finally being given the credit he deserves for painting “You Are Now Entering Free Derry” on the iconic Bogside wall. More than delighted because I was also relieved. The fact that Liam had long been denied recognition for his role in relation to the Wall was mainly my fault. But he had never given out to me about it. Which made me feel more guilty than if he’d taken me to task every time we met. It is also true that Caker Casey had painted the slogan. But Liam’s was the original. The confusion arose when I approached a bunch of guys, including Caker, around the bottom of Wellington Street in late 1972 or early 1973 to ask whether anybody could remember who had painted the slogan back in January 1969. I wanted to include the name in an account of the period which I was writing. It was well remembered that Caker had painted the first “professional” version of the slogan, with regular letters of similar size in neat array. But had he also inscribed the rough-and-ready rendering of the night after the Burntollet march? Nobody, including Caker, could say for certain. What we did know was that Caker had painted the version then on the wall---and could easily have been responsible for the original. Certainly, he had been a dab hand with an energetic paintbrush around the area at that time. “I think it’s fair enough, then, to say you painted it,” I told him. And that’s what I wrote in “War and an Irish Town”. 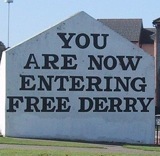 Back then none of us knew that, decades later, the image of Free Derry Wall would be known (and misunderstood) far and wide and reproduced on postcards, t-shirts, dishcloths and all manner of knick-knacks, some of them more appropriate and less paddy-whack than others. It didn’t occur to me then that the identity of the original sloganeer would become a matter of public interest. Fast forward about 20 years and I’m standing at the bar at the Gweedore one afternoon when a fellow approaches and says, “I have a bone to pick with you McCann.” It was Liam. He said that it had been himself who had originally written the slogan on the Wall: reasonably enough, he wanted to know why I’d attributed it to Caker. I explained what had happened, said that I didn’t disbelieve him but that at this stage it was hard to know what the truth was. I couldn’t deny his claim, but couldn’t substantiate it either. “Do you not remember me coming over to you and asking if there were two rs or one r in ‘entering’,” he said. And in that instant, I did. I had the image clear in my mind. I told Liam I would take the first opportunity that came along to set the record straight. “Don’t worry about it,” he responded. “After all, it could easily have been Caker.” A remarkably generous reaction. Subsequently, I did set out the truth of the matter in a number of magazine articles and in an interview for a book on Irish sites of historical significance. Now that Andrew Quinn has published the story in his interview with Liam, I feel there’s a weight of responsibility lifted from me.